How can I streamline my search so I don't get irrelevant hits? You can search using more than one keyword via Advanced Search and selecting “And” from the drop down menu to the left of the additional search terms. To limit searches to a particular string of words of two or more words, put them in quotes ("university of louisville") -- this works in Basic Search as well as Advanced Search. Advanced Search also allows you to limit your search to title, creator, and notes, as well as searching by keyword. You can exclude hits containing specified words by selecting "Not" from the drop down menu, and include records that contain one or the other of two or more words by selecting "Or." On the right side of the screen, enter additional terms in the box labeled "Filter Results." This will refine your search to include only those records that contain the values specified in your initial search, and this additional value. Below the "Filter Results" box, you'll see an area labeled "Additional filters." By clicking on these links, you can limit your results to subcomponents of collections (these may be series, sub-series, or folder titles), records for creators (usually people or organizations), and records for whole collections. What is a "collection subcomponent"? Briefly stated, it's a description of a part of a collection. Because archival collections reflect the life of the person or organization who created them, they are often complex. In order to make easier for researchers to work with archival materials, archivists often break them into chunks and prepare a multi-level finding aid. We provide a summary of the collection, but also provide information on subdivisions within the collection. These are often called "series," and they contain materials that relate to each other, like "Correspondence" or "Financial Records." In addition, most archival collections are stored in folders within boxes. A complete description of a collection will also include folder titles. Folder titles, series names and individual item information, when available, are all "collection subcomponents." What types of materials are included in the Archives Catalog? Currently, the catalog includes descriptions of collections of personal papers, institutional/organizational records (including UofL records), microfilmed materials, and descriptions of some of our photograph and rare books collections. We are adding to the catalog every day, but if you do not find a collection you believe we have, don't hesitate to contact us by telephone at 502.852.6752 or by email at archives@louisville.edu. The catalog includes links to collections that are available (in whole or in part) in our Digital Collections. Information on individual rare books is available in the Libraries Catalog. How do I access materials I see described here? In most cases, you will need to visit Archives and Special Collections in person. For details about our hours, location, and policies, please see our page on planning a visit. 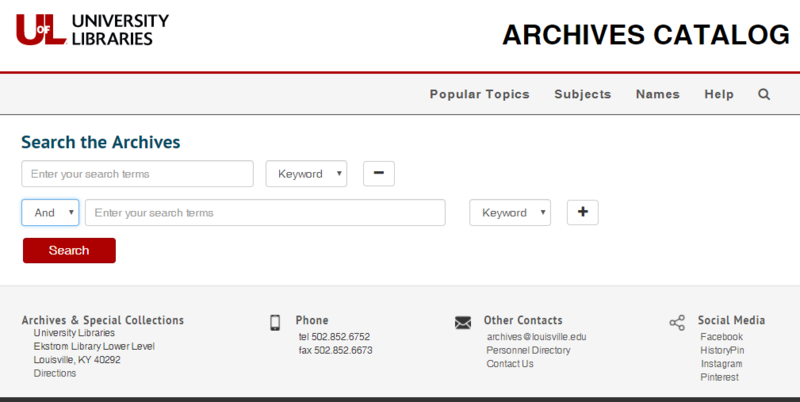 We are happy to answer reference questions by telephone at 502.852.6752 or by email at archives@louisville.edu. If your question is particularly complicated or extensive and you are unable to visit us in person, we may refer you to our list of local researchers so you can hire someone to conduct research on your behalf. A small (but growing) portion of our materials is available online via our Digital Collections. When any part of a collection is available in Digital Collections, there will be a link to the corresponding collection in the ArchivesCatalog. How do I cite archival materials? Archives and Special Collections recommends treating published items found in reference files like other published materials. For unpublished items, see examples on our Citations for Archival Materials guide. What system(s) do you use to run the Archives Catalog? 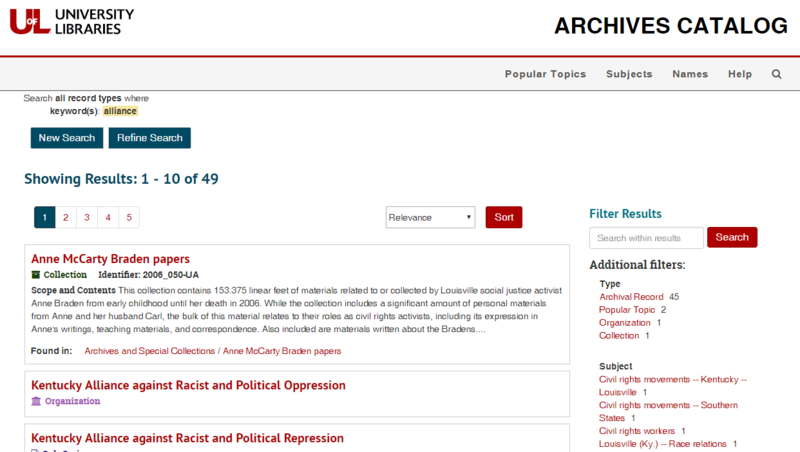 The Archives Catalog was created using ArchivesSpace, an open source archives information management application for managing and providing web access to archives, manuscripts, and digital objects. Bootstrap provides the framework for the public interface layout and design.